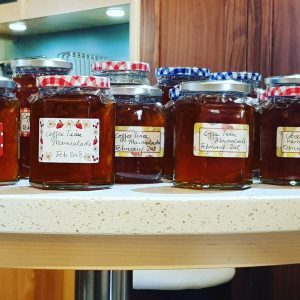 Winners at the Dalemain Marmalade Festival? Crafted by hand in Matterdale, our lovely marmalade. Well if you are asking, no, far from it, as we didn’t even manage to submit an entry. Some confusion over the date for submission, but we were undeterred and laid plans for making some mellifluous golden marmalade. Of course because we were too late for entering the competition we were also rather late for the Seville orange harvest. After an ad hoc meeting in Booths, Emma and I confirmed they didn’t have any as it had passed the end of the season. Emma persevered at Morrison’s, Sainsbury’s and any other supermarket within 50 mike radius, but no luck. Thus we would have to make jam. However Emma being the resourceful woman she is, located a last precious offering of Seville oranges. It is so secret I can’t tell you where she got it from(just in case we get confused again next year and need some last minute Seville oranges). It was all on. But then the day before it looked like it might all be off as there was a shortage of jars, but my mother came to the rescue and Bea raided her cupboards. Thus on the morning of 22 February we gathered to start preparing the oranges. Cutting, scraping, boiling, an electonic thermometer, water and a heck of a lot of sugar. Somehow it all came together and Hilly’s lovely labels, seals and elastic bands made the jars look very homely, but professional. Some hours later we had 16 jars of set marmalade. To be honest I’m not sure how it all happened as I spent too much time talking. I think I cut up the peel into the requisite sized lengths and I did try to pay attention to the recipe, but if you asked me I’m still pretty clueless as to how to make marmalade. Copyright 2019 Hutton John Estate. All rights reserved.